It was a long, long day. For the most part, it went well. 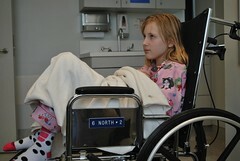 Jordan cooperated with the technicians for her MRI and she came to afterward with only minor fuss. She was groggy for the early part of the afternoon. Unfortunately, computer trouble at CHLA kept her doctor from having a look at the scans, and it is too early for the radiology report. We may have results tomorrow. We spent a lot of time with the doctor today, reviewing her case and tracing the history. It is growing likely that Jordan will have more surgery. Some of the reports are in from all the tests on her legs. 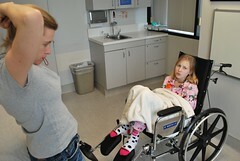 The doctors doubt that physical therapy alone will restore her muscles to normal functionality. As for the tumor, without having the latest analysis of the scans, we’re coming upon another fork in the road. Assuming that the scans will show that the enhancements remain stable, we may begin down a path that ends Jordan’s chemotherapy. Her tumor is an unusual beast. It’s very hard to tell if it is still active. What we see in the MRI scans may in fact be dead tumor. The only way to know for sure is another biopsy, and neither we nor her doctors are keen on poking around in her head just to see if the tumor is alive. We may continue her current regimen of chemotherapy for another 6-7 months, then stop and monitor her progress at frequent intervals. The effects of cancer interfered in Jordan’s life in 2003. She was four years old. From the very beginning, her journey has been unpredictable. The doctors spent most of the first two years trying to figure out what was making her sick. Our options were never entirely clear. After she was diagnosed in late 2004, the path seemed deceptively more defined. But every time we thought we understood the situation, the path twisted beyond our expectations. Cognitive deterioration. Seizures. Immobility. Coma. Her tumor is so rare, there is no probability curve. Once again, we’re in uncharted territory. It has been two years since her last hospitalization; two years since she hit rock bottom and left us for a week, drifting in unconsciousness. Today, she is thriving on many fronts. She is growing (in the 75th percentile for height), blossoming, and learning. And while we are happy that she may soon put an end to weekly dates with a needle and a dose of toxic medication, we’re still paralyzed by ambiguity. Any journey with cancer is an uncertain one, but Jordan’s journey has become an epic without a third act. Obviously, we hope that act is the triumph of the hero. We hope she takes a cue from Joseph Campbell and returns from the abyss with the magic elixir. Perhaps she has. The trouble is, we don’t know. And so our family snipes at each other and stumbles over tension when we should welcome a little closure. It’s hard to welcome closure when the next chapter is as ambiguous as the first.